Oh boy, I haven't posted in a week! Sorry about that. Things got busy and I got behind. :) I have a few recipes to share so I'll do it over the next couple of days. Last week I made Giada's homemade marinara sauce and it was DELISH! I will definitely be making it again. About a month ago I tried a different recipe for homemade marinara and I did not like it at all! It was very watery and not flavorful enough. 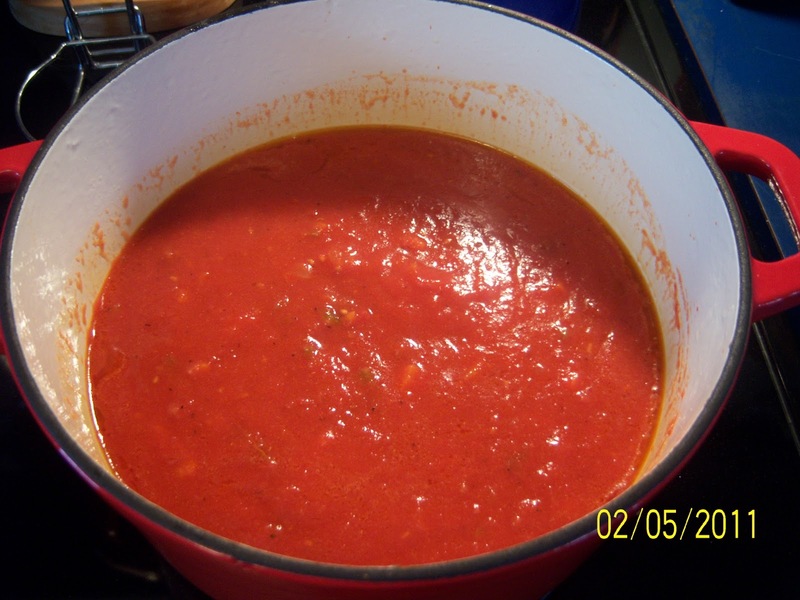 This new recipe makes 2 quarts of sauce, so the first night I had it with four cheese ravioli. 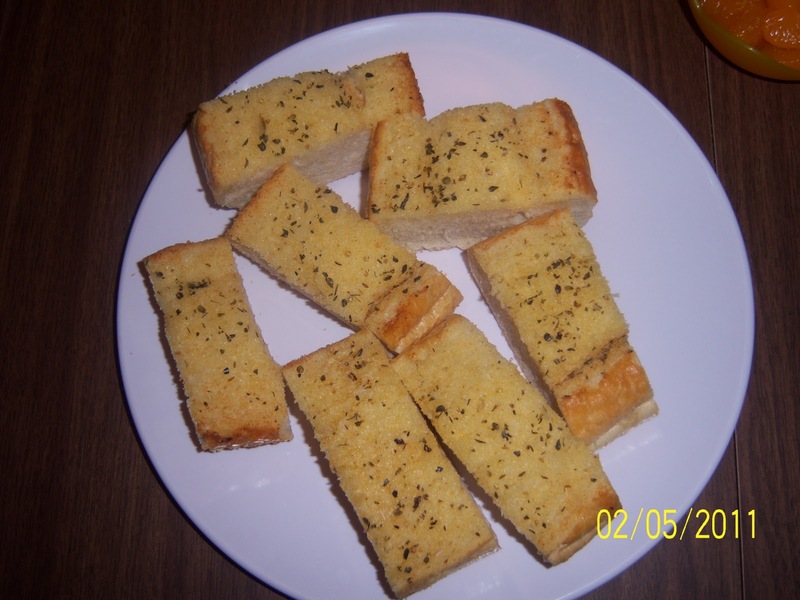 I also made my own garlic bread and it turned out so amazing I almost couldn't believe it! So easy and inexpensive...I will be making this from now on instead of buying the frozen kind. :) Anyway, I refrigerated the rest of my sauce and last night I made rigatoni with meatballs. Yum-o! Pics and recipe below. Enjoy!! Directions: In a large pot, heat the oil over medium-high heat. Add the onions and garlic and saute until the onions are translucent, about 10 minutes. Add the celery, carrots, and salt and pepper. Saute until all the vegetables are soft, about 10 minutes. Add the tomatoes and bay leaves, and simmer uncovered over low heat until the sauce thickens, about 1 hour. Remove and discard the bay leaves. Season the sauce with more salt and pepper, to taste. 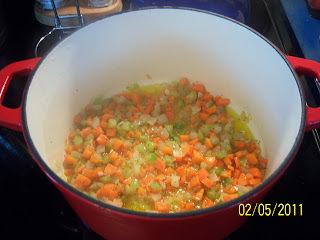 I also used an emulsion blender to blend my sauce very smooth as I had some small chunks of veggies in the sauce. Everyone likes their sauce a different way, so you can skip this step if you want. The sauce can be made 1 day ahead. Cool, then cover and refrigerate. Re-warm over medium heat before using. I took a loaf of italian bread and sliced the very top of it off, lengthwise. I took about 3 tablespoons of softened, unsalted butter and mixed it until smooth, then added garlic powder and a pinch of salt. I kept adding a little garlic powder, mixing it up, and tasting to get the right amount. It depends on how garlicky you want the bread to be as to how much you should add. Just get it right for you. 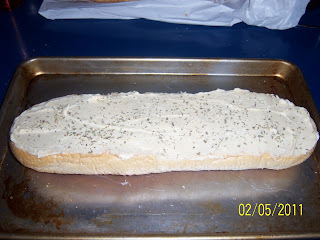 I spread the butter all over the top of the bread and then sprinkled dried oregano over the top. (You could use fresh oregano too, I just didn't have any at the time!) Pop it in a 400 degree oven until the mixture is melted and the top of the bread is lightly browned. Voila!